When I received Raymund’s email to do a guest blog posting, I was both thrilled and honoured! I’ve always been a fan of Filipino cuisine and Ang Sarap is my “go to” blog whenever I had a recipe in mind. I love how he explained the origin of each dish and then proceed tempt me with his wonderful photography and culinary skills! Please visit Ang Sarap to view my guest post! When I was asked to create a dish representative of my culture, I was torn between my two halves. I’m of Southeast Asian descent – namely Singaporean and Indonesian. Although the food in both countries are largely similar and carry heavy influences which were sometimes based off one another, they also differ in many aspects. Like all other cuisines, each is unique and boasts their own signature dish. After much contemplation, I settled on Martabak Manis (Coklat Keju), loosely translated to Sweet Indonesian Thick Pancake (Chocolate & Cheese). It is also known as Terang Bulan amongst the locals. 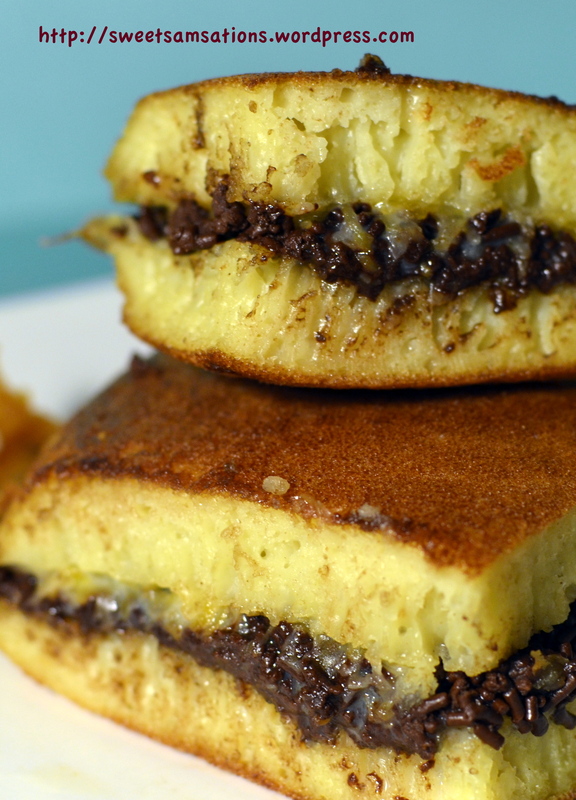 Martabak Manis is a common street food that can be easily found in the streets of Indonesia. If you were to ask my dad what his favourite dessert in the world was, his answer in a heartbeat would be Martabak Manis. Speaking of heavy influences, a similar pancake in Singapore and Malaysia exists in the name of Apam Balik / Ban Jian Kueh. The sweet filling sandwiched between this pancake traditionally consists of condensed milk, chocolate, cheese, fruits and crushed peanuts. Lately however, the increase in modern bakeries gave rise to a variety of fusion flavours, including Blackforest and Tiramisu Martabaks! mmmm! Possible blog posting idea! The texture of a good Martabak Manis has to to be soft and chewy with its distinct honeycomb texture visible. heavily modified from Ny Prudianti Tedjokusuma - 525 Kumpulan Resep Mak Nyusss! In a small bowl, mix yeast with warm coconut milk and let it sit for 10 minutes or until bubbles form. In a large bowl, sift sugar, salt and bread flour. Mix in coconut milk mixture and allow to rise for 2-3 hours in a warm place. You should be able to see a lot of holes forming on the top. To the egg mixture, add baking soda dissolved in water and mix well. Combine egg mixture with coconut milk mixture, beating for about 30 seconds on medium / low speed until well blended. Preheat the skillet or griddle with LOW HEAT. Grease the pan and sides with a little margarine. Pour the batter, cover and cook until you can see bubbles start to form. This will take approximately 10-15 minutes or until top is full of holes. Ensure that your heat is LOW so that the skin doesn’t burn. The level of the batter should not exceed half the height of the skillet. Spread margarine on top and finally sprinkle with grated cheddar cheese, chocolate and sweetened condensed milk. Remove from the pan and fold it in half immediately like the shape of a semicircle. This will prevent the cake from cracking. Spread the outer surface with margarine to keep the cake moist. Best served warm! Thanks Raymund for letting me guest post on your blog!! So honoured to be a part of the “Ang Sarap Inspirations”! 🙂 Really enjoyed doing this post! Those pancakes are stuffed with SO MUCH DELICIOUSNESS! I want them…now. What an interesting dessert. I haven’t heard of this before. But the ingredients list and the look of the finished product is wonderful. I would love to try these. the texture of the cakes is so interesting — i’m not sure i’ve ever tried this kind of thing before. it looks really good. Thank you Justin! Yeah, the texture is a little different in the sense that it has a honeycomb texture made from yeast! Sammie these little pancakes looks so sinful. That up close picture is to die for. I can just tell this dessert will be one of my new favorites. Thanks Bam! not gonna lie! They’re pretty sinful / fattening. hahaa.. Especially the ones sold on the streets of Indonesia. They add lots and lots of margarine and crazy amounts of cheese + chocolate + condensed milk + you name it! But they are soooooooo goooooood!! 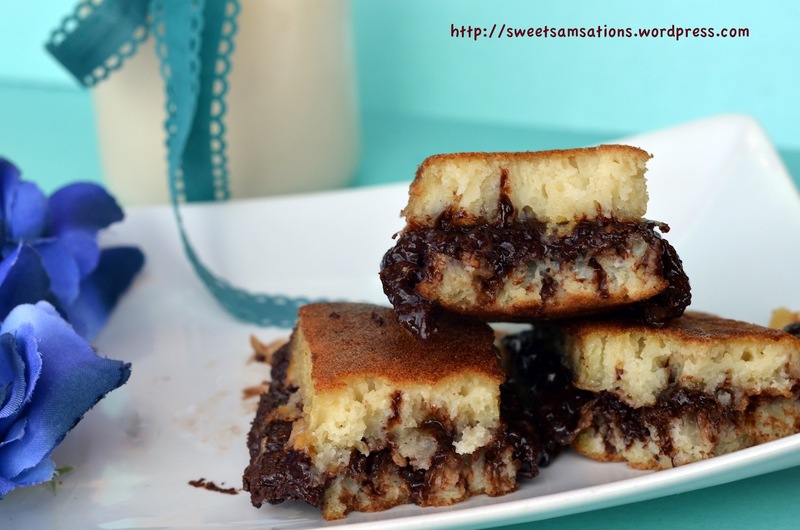 Hi Sammie – Thanks for recommending a pan with a Teflon® non-stick coating for your Martabak Manis. I represent DuPont and it’s always a pleasure to see people recommending our products. These look absolutely delicious =D they kind of remind me of Japanese pancakes (Doriyaki) because they are thick and have yummy fillings as well 🙂 I recently made Hoddeok which are sweet filled korean pancakes so might give these indonesian ones a try this weekend =) thanks for sharing!! Do you mean that the sweetened condensed milk, chocolate AND cheddar cheese are in one pancake? Or is it an either or thing? Also, you have inadvertently repeated an entire paragraph. Hi Eva! Thanks for bringing that to my attention! I wouldn’t even have noticed! haha.. Well, think of it as being in Starbucks where you get to customize your drinks however you want it! In Indonesia though the most popular combination is usually chocolate, condensed milk AND cheese, or chocolate, condensed milk AND peanuts. But of course there are some who prefer to leave the cheese out or the chocolate out! Some like peanuts + cheese and some even add fruits like bananas / jackfruits! Chocolate and cheese or even condensed milk and cheese are a very unusual combo, any way you look at it. These look so interesting – in a good way! Definitely not on the diet, but a gal can dream can’t she? haha.. Yeah! Probably!! I knoww! I ate so many of these myself, the failed ones. lol! Those pancakes look insanely good! Want them, please. They look amazing. I’ve never seen them before but I’d love to try a pancake sandwich like that! Yum, yum, yum! And, I love Ang Sarap as well! Your welcome!! I hope you enjoy them Lorraine!! I hear there’s a lot of these in Aussie because of the many Indonesians there! Sam, I saw your post at Raymund’s blog – but here I can see more detailed pictures and glad I stopped by just in case I won’t miss anything! Great guest post! aww! Thanks Nami!! 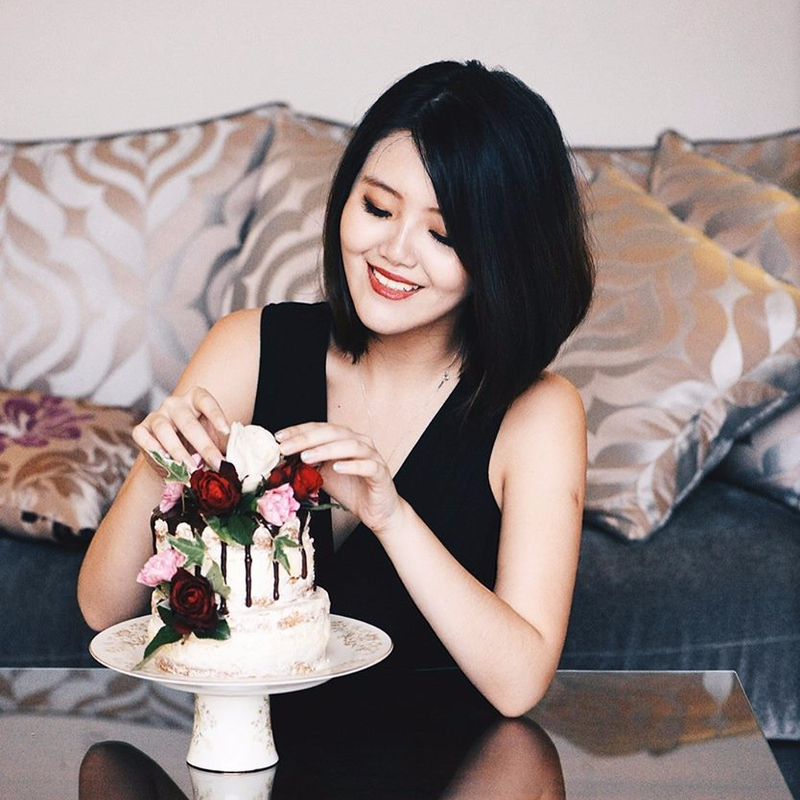 🙂 I loved your guest post too! 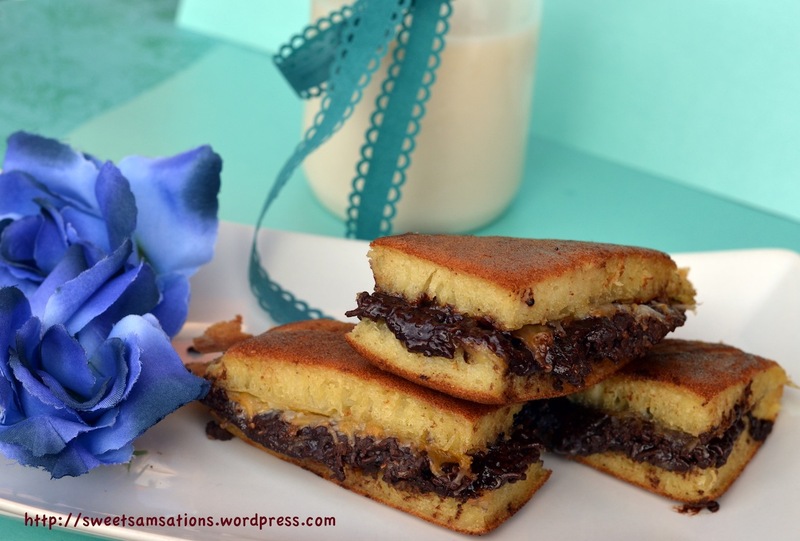 Great guest post, Love soft and chewy texture and glad to learn about Indonesian dessert. I did hop over to Raymund’s blog. Nice dessert Sammie…I’ve seen similar dessert in Japanese store…they look so good, fluffy and sweet. Thanks Juliana! Yeah! 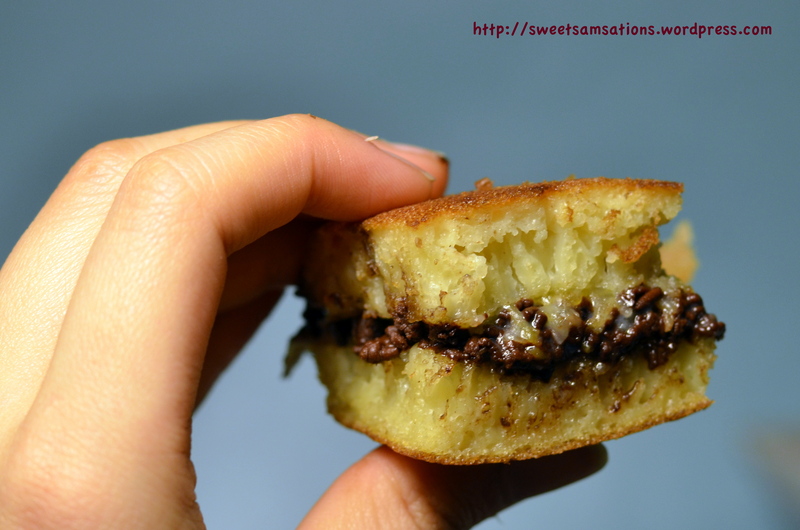 They do remind me of Dorayaki sometimes because of the sweet fillings! ooh, this sounds + looks soooo good – awesome guest post! off to check out Ang Sarap! Thanks Carolyn!! Yeah! There’s a specialty store in Jakarta that sells all these craaaaazy martabak flavours!! Awww thank you for such a sweet comment Terra! Never seen sweet martabak before, look similar like apam balik, enjoy with a cup of teh tarik, must be good! oooh! haha.. Yeah it’s more of an Indonesian thing I guess! But it’s very similar to apam balik! Sometimes I eat mine with peanuts and chocolate too! Thanks Sonia! Awww!! Yes! Martabak is like one of the most amazing Indonesian snacks EVER!! We always get boxes of it whenever we go back to JKT. hehe.. I still have yet to try the more interesting flavours! Hope you enjoy this recipe, although it still can’t beat the ones they sell on the streets in Indo. Seriously the next time I go visit, I’m so tempted to just buy the recipe off a vendor! hahaha..
Sammie, is there anything special about the pans they use, or are they just large cast iron pans? Hi Sammie. This looks amazing and I’m going to give it a try. Just a quick question though…how much condensed milk do you add? I’ve never used it before, so I’m not quite sure how much to use! Thanks! Hey John! Awesome! I hope you enjoy it 🙂 I would say use the condense milk up to your own discretion! I would say.. about 2-4 tbsp should suffice! Hi sam, nice blog – i love it! I am an indonesian living in the states now so all of your explanations are soo usefull to me. Say, if i use Kara, do i need to dilute it with water or i can just use it as is. Also, what kind of cheese did you use? Reguler kraft cheddar? Thanks! Hey there, just came across your blog when I was searching for Martabak Manis, recommended by my Indo friend to makan in Jakarta. What is chocolate rice and where can i get it or what can i use instead? hope this doesn’t seem like a dumb question. Thank you for sharing this recipe. I have never thought of making my own maturbak. Can I check if it is ok to substitute coconut milk with fresh milk? Hi dear, I believe there are special pans for this. But I didn’t possess them so I used a nonstick instead! Hi! Would really love to try this. However I have a question, is it possible to precook some, freeze them then thaw and heat them up later? Like pancakes. I’m thinking to make big batch of it. Again thank you for posting this recipe! A question: is it possible to make a big batch of this and freeze them for later?